The Pondosa Branch extended from Bear Flat four miles into Pondosa. The entire line was in place by the 1940’s, as it was the start of the lumber company line south into the Ditch Creek country and the harvest activities taking place in the Clark Creek drainage. Pondosa was established in October of 1927 as the first permanent log camp of the lumber company. However, Pondosa had not been in business very long before the lumber company purchased the Whitehorse tract and started operations in it. Pondosa was actually closed for a time in the early 1930’s as the lumber company focused it’s energies to the east. Operations resumed in the mid-1930’s. Pondosa-based crews first harvested the extensive holdings in the Bear Creek Drainage before shifting south to the Ditch Creek country. Pondosa as a camp remained active up until 1964, when U.S. Plywood consolidated all logging operations into McCloud. Harry Horr moved his sawmill from Cayton Valley to Pondosa in 1930. The mill was sold to the Cheney Grant Lumber Company in the 1940’s. Cheney Grant provided sufficient traffic through the 1960’s and 1970’s to warrant three trains a week up the branch. The branch was worked by the regular Burney freights. Cheney Grant sold out to Louisiana Pacific in the late 1970’s, and shortly afterwards the sawmill shut down. The branch was used to store boxcars for a while after the closure of the sawmill. However, the branch crossed the county road three times in four miles, and the railroad eventually tired of maintaining three crossings on a railroad that did not produce any revenue. The branch was scrapped in the mid-1980’s to a point just before the first grade crossing. Highway 89 was crossed by a low bridge that was a thorn in the side of state highway department, and a deal was worked out that saw the bridge come out about 2000. 5/2003. The Pondosa Branch is seen here curving away from the mainline at Bear Flat. The boxcars are in long-term storage on the branch. A wye used to exist at this location, with the third leg curving back into the mainline to the right. Bear Flat and Upper Pondosa yards used to exist in this area, and the forest floor is littered with old railroad grades in this entire area. The site of the former bridge over Highway 89. 5/2003. Rails are still in place on the marooned portion of the branch. 5/2003. Remains of a bridge on the Pondosa branch. McCloud Rails staff originally believed that this bridge had been washed out; however, we received an e-mail from Matt Simons containing the following information. "I was looking through everything on your website this evening and noticed something that wasn't quite accurate. On the Pondosa branch, the bridge one mile east of the old highway 89 crossing was not washed out. In the fall of 2000, myself, Jeff Harris, Mark Sietzinger, and Eddie Padula removed the main support beams to be used to repair the old warehouse in McCloud. It was in perfect shape when we arrived. The plan was to remove all of the 9"X17"X30' timbers, but other maintenance tasks prevented us from going back. It was cool to help take the thing apart. All of the construction was so solid we had one heck of a time getting those beams apart! We ended up shattering the pivot gear on the old white boom truck, so we were only able to get five timbers back to McCloud." Thanks to Matt for the correction! The #25 crossing the bridge over Bear Creek in 1970, This was the last time a steam locomotive operated into Pondosa. Photo by and courtesy of Dennis Sullivan. 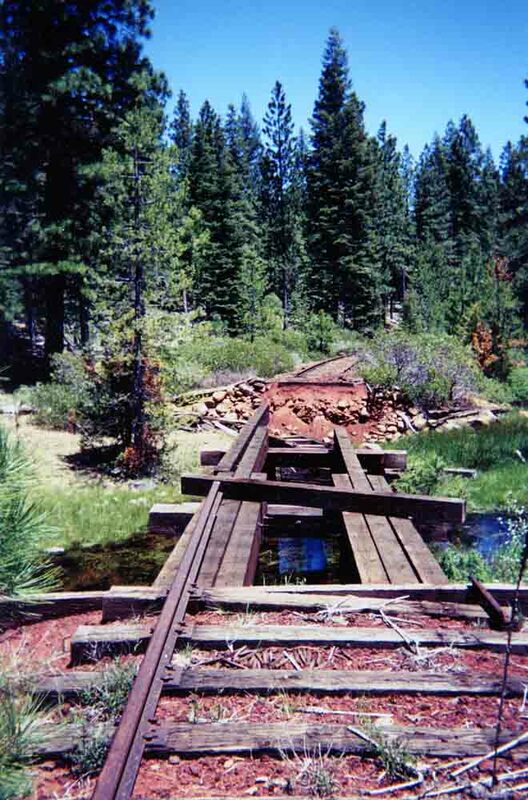 The Bear Creek crossing as it appears today (6/2004).